If you love the sparkle of diamonds but want a more affordable gem, moissanite is a great choice. Since moissanite first hit the jewelry market in the late 1990s, it's been popular with brides on a budget, as well as those who have concerns about the ethical or environmental impact of diamond mining and sales. Moissanite graces engagement rings, wedding bands, and bridal sets of all metals and styles, so you're sure to find a beautiful ring that's perfect for you. To see retail details for any of the rings in the following sides, just click the "Buy Now" button on the photo. If you're a fan of the classic solitaire, this round-cut one-carat moissanite ring can be a striking choice. The 14k white gold band gives a classy glow to this understated and affordable choice. This ring retails for under $1,700. The gorgeous filigree work on this 14k white gold moissanite ring sets off the sparkle of the gem. Feminine and beautiful, this ring features 1-1/6 carats of moissanite and retails for about $800. A moissanite ring can be just as stylish as a genuine diamond, as you can see with this gorgeous twisted shank example. The ring features a round oval cut moissanite and accent diamonds are set along the sides for a total of 1.04 carats, and the sterling silver setting adds to its beauty. A little under $550, this is a good choice for brides on a budget, as well as those who love simple style. 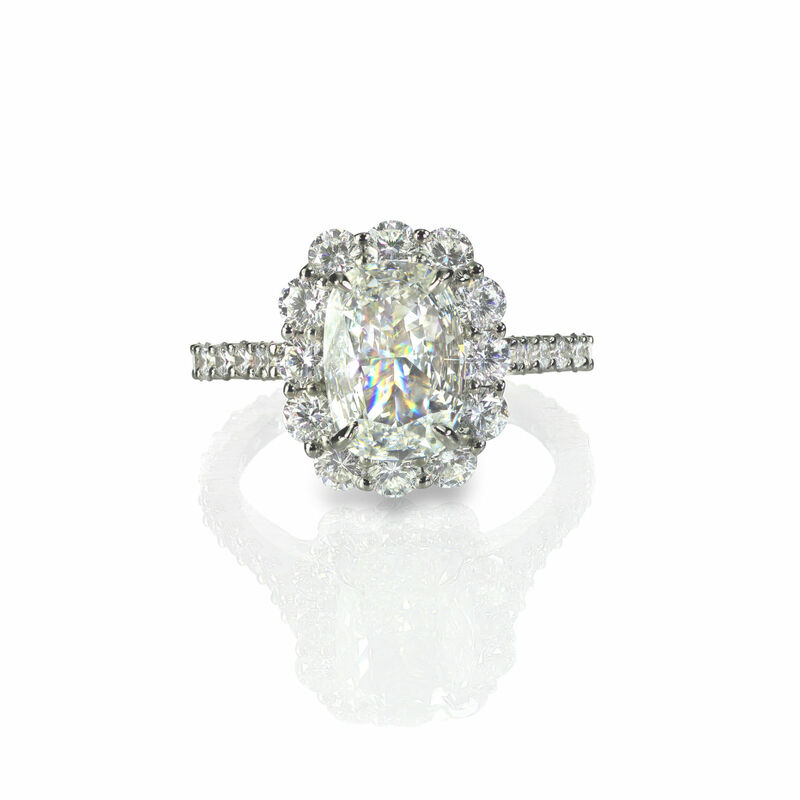 Although it's a fairly modern material for jewelry, moissanite enhances vintage-style rings beautifully. This 14k white gold ring features a colorless, bezel-set moissanite gem, flanked by moissanite accents on the band. The stunning emerald cut of the center gem makes it the perfect look for the bride-to-be who loves antiques. It retails for around $700. Moissanite also shines in a beautiful modern three-stone style. This platinum ring features a large round-cut center moissanite, flanked by two round cut Moissanite gems. The band has vintage detailing which makes it ideal for the romantic woman. It retails for just under $400. You can purchase a moissanite engagement ring and wedding ring together when you buy a bridal set. This pretty 14k white gold set features 2.33 carats of moissanite gems and diamonds, including a large round brilliant center stone. It's a great choice if you're looking for a cohesive look and plan to wear your rings together. The set retails for about $1,500. An eternity band is perfect for a unique engagement ring choice, and it also makes a gorgeous wedding band. This beautiful ring features one carat of moissanite gems set in 14k white gold for a continuous band of sparkle. It retails for just under $600. Moissanite also looks lovely gracing a sterling silver wedding band. The gems are channel set, which makes this ring an ideal choice for the modern bride. It retails for under $145. Men can wear moissanite too, especially if the ring is as attractive as this 18k yellow gold wedding band featuring channel set moissanite. The ring retails for under $122. Whether you're looking for an engagement ring, wedding band, or set, remember that shopping for fake diamond rings is just as important as shopping for genuine gems. Take your time and do your research, and you'll end up with a style you'll love for years to come.